Buying replacement windows can be stressful, especially when it comes to choosing a reliable company to make and install them. There are several things you should consider when deciding on a window replacement company, and it is important you make the best decision for your investment. What Should I Look for in a Replacement Window Company? Replacement windows are an investment in your home, safety and comfort. A product that is going to look great, perform and last, is going to cost more than the often advertised $189 window. Perhaps more important than the cost, is the value. What are you getting for your investment? Learn more about what goes into the price of a window and what you should expect the cost to be. Research reputable companies that are invested in local communities and that have been in business for several years. Do they manufacture their windows or just install windows manufactured by another company? Where are the windows from? Stanek® windows are engineered and manufactured in the U.S., custom designed and manufactured to guarantee a perfect fit in your home. Stanek windows offer unsurpassed beauty, endless custom options, and each window is engineered for performance and built to last. Factory-trained Stanek window installers ensure proper window installation, which is vital to long-term performance and quality control. Credibility. When investing in replacement windows, it is important that you find a company you can trust. Ask the company how long they have been in business and review their website for previous customer testimonials. Also ask for references to determine whether or not they are a reliable company. Cost. Purchasing replacement windows is a substantial investment, and you want to make sure they look great and last for years. Sure, there are bargain windows, but these are often smaller than average or windows of lesser quality. If you want a beautiful, quality product that will last, expect to pay more than bargain price. Installation. Proper window installation is crucial to your new windows’ performance. At Stanek Windows, we provide professional installation services, which are vital to the lifespan of your windows. Let our professionals handle the window installation process for you, and make it easy and stress free. Certifications. It is essential to check the accreditations and certifications of the replacement window company you are researching. When shopping for windows, do not accept a verbal promise that windows are certified. Ask to see documentation of the certification before purchasing your windows. Labels from the National Fenestration Rating Council® and ENERGY STAR® show that a window has met important performance requirements. Warranty. You have the right to make sure your window installation is covered by a guaranteed warranty. Find out who is responsible and what the process is for scheduling service, should an issue arise. Looking for more tips on how to choose a replacement window company? 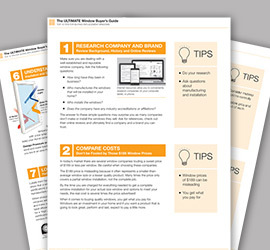 Download our free Ultimate Window Buyer’s Guide for 10 helpful tips on buying replacement windows. 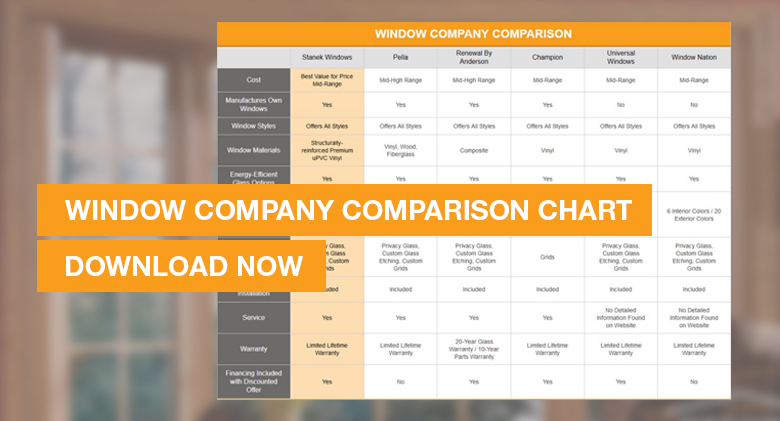 Use it as a guide when comparing multiple window companies. Your window shopping just got easier! 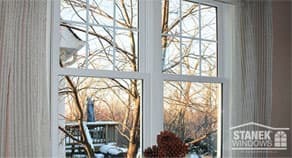 Before you choose a window company, it’s important that you decide in advance what type of window is best for your home. 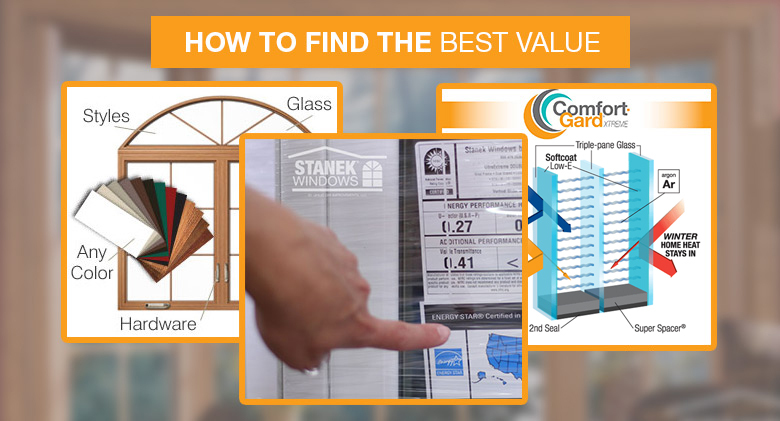 Most companies specialize in one type of window, vinyl, wood or vinyl-clad aluminum, so it is important to decide what you are looking for ahead of time. If you are looking for beautiful custom designs and superior performance, look no further than Stanek Windows. We know that each dollar counts, so we make sure you are receiving the highest quality product and installation for your money. What Window Style is Best for My Home? Double-Hung Windows – Great for walls next to patios, decks and walkways, double-hung windows remain flush with walls and tilt-in for easy cleaning. Sliding Windows – Gliding, or sliding, windows can be found in areas where it may be difficult to lift or close a window, such as above a kitchen sink or behind a bathtub. Awning & Casement Windows – Stanek’s awning and casement windows open outward and are often found in bedrooms and living rooms, where they can provide maximum ventilation. Bow & Bay Windows – These windows can create a beautiful focal point or a cozy reading nook in a favorite room of your home. Custom Shape Windows – Stanek offers decorative windows in a variety of custom shapes and sizes, which allows for endless possibilities. Finding an affordable but reliable window company may be overwhelming at first, but it doesn’t have to be. 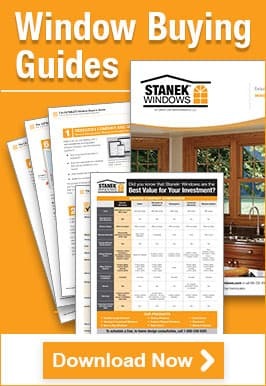 Schedule a free, in-home estimate with the professionals at Stanek Windows today and make a great buying decision.